The Rye Bay area will delight you wherever you stay. 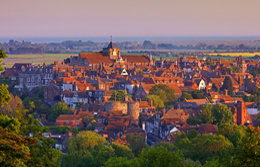 Directory listings for Rye Hotels, Rye Bed and Breakfast and Self Catering Accommodation in Rye are laid out in alphabetical order by gradings - starting with highest. For the location of each venue, see location map underneath the details of each Rye accommodation provider. The search box on the left will show accommodation providers with online booking facilities so you can search and book. All guesthouses will show all guesthouses offering Bed & Breakfast - not just those offering online booking. Select accommodation using the buttons above. You can choose between Rye Bed and Breakfast and guesthouses, Rye hotels and Rye self catering accommodation. All accommodation providers have been, or are waiting to be, inspected by one of the recognised assessing bodies. Quality In Tourism (for Visit Britain) or the AA. Both have assessed accommodation to the same criteria and have been awarded one to five stars.